Our weather is controlled by the laws of Physics. According to the first law of thermodynamics, energy can be neither created nor destroyed – it can only change forms; for a thermodynamic cycle the net heat supplied to the system equals the net work done by the system. In a planetary weather system, the energy from heating the planet surface doesn’t just disappear, it combines with the motion of the planet to create winds, and it fuels the intensity of storms. Also, when the planet heats, water evaporates into the air, becoming the liquid (water, ice, or snow) in those storm clouds. The more the planet heats, the more storm “work” the planet will do, and the more water/ice/snow those storms will contain. Snow in winter is to be expected. Massive snow dumps, one after another in areas that don’t usually get much, if any, snow … not so much. The increasing number of larger storms is not predicted based on past, stable weather patterns; but is predicted if you change the amount of heat in the planetary weather system – such as the increase that has been created by humans burning massive amounts of fossil fuels. Those fuels create a blanket of gases that trap heat that would otherwise have escaped into space. When it comes to messing with the weather, the first law of thermodynamics isn’t our friend. But it’s not just the US being hammered, today. At the same time the US is being slathered in slippery white stuff, the people in an already devastated part of Australia are being hit by a record Tropical Cyclone. A tropical cyclone is basically the same as a hurricane, here, but spins the other way, because of it’s location south of the equator. If you remember Hurricane Katrina, you’ll have an idea what we’re talking about, but this one’s larger. And unlike the US Gulf Coast, which hadn’t had too much rain activity before Katrina hit, Queensland Australia has had nearly non-stop flooding since October. Last report was hovering between a high category 4 and low category 5 Cyclone. (5 is the largest possible on the scale). A category 5 storm has sustained winds similar to those in a tornado. Imagine being hit by a tornado thousands of miles wide. 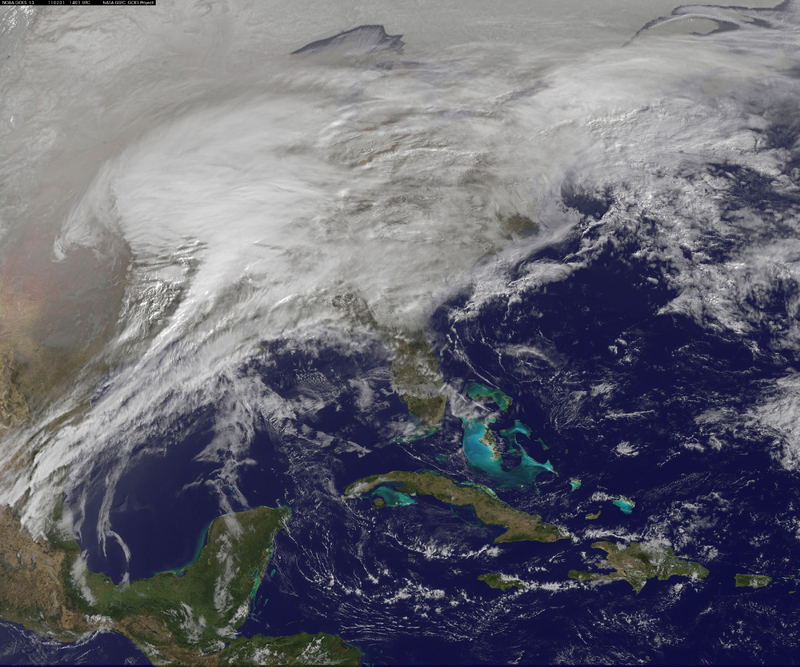 To give a sense of scale, the current storm in the US covers the Eastern 30% of the continent. 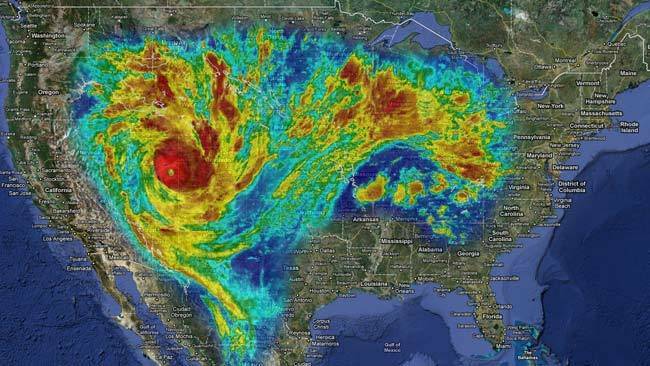 Someone clever took a satellite image of Tropical Cyclone Yasi and superimposed it over a map of the US (to scale, see image at left): If it hit here, it would cover 80% of our continent. Cyclone Yasi is nearly 3 times as large as our current massive snow storm! Today, 1/3 of the US population is being deluged with snow, sleet or ice from a single massive storm, and the people in the Queensland Province of Australia are watching the destruction of everything they hadn’t already lost in this season’s massive, ongoing floods. Do we really want to continue increasing the number of these monster storms? We actually have some control over this – because we control one of the major sources of heat on the planet: fuel burning. Another rule of physics says “for every action, there is a reaction.” Our actions today and tomorrow will cause reactions across our planet. Some of them will be relatively mild, but far too many will be devastating. One small, bright spot in today’s storm here in the wintry part of the planet: the eastern 3rd of the US has a much lower carbon footprint than normal, beecause we’re not all out flying on planes, sitting in traffic jams, and turning on lights and computers by the tens of millions. A small breather for the planet, but not nearly enough. We need to get serious, because the consequences of failing to cut our fuel burning (and the resulting warming of the planet) are serious. Very serious. Monster storms and disrupted weather patterns will be the new normal if we fail. I have to say though, Australia would probably be well advised to look at its own greenhouse gas emissions. The irony of its international position could not be more clear. Good point, Nicola. Alas, our audience is in the US, so there are few Australians reading this. I have heard that the new Australian Prime Minister is pursing carbon policies such as a carbon tax, as well as cap and trade. This is a big step, because Australia is the number 1 black coal exporter in the world. I have a feeling the massive, super-hot wild fires over the last couple of years, and the current massive flooding may have helped the people of Australia recognize that a changing climate can be a very unfriendly thing. “Warming” sounds nice, but when it really means “raging infernos and devastated flood plains,” it sounds a bit less appealing.